The process of finalizing the revitalized Agreement on the Resolution of Conflict in South Sudan (ARCSS) under Sudan mediation is intended to accelerate and renew commitment of the warring parties to pledge for peaceful settlement of the political crisis in the country. This essential process should meet some critical benchmarks such as inclusivity. This report examines the process of examining the HLRF under Sudan Mediation aims at building facts for promotion of trust and confidences on the revitalized ARCSS. Community Empowerment for Progress Organization-CEPO would like on appreciate every person who has contributed in making this observation report done at various capacities. Special thanks go to our enumerators and the journalists that cooperate with us in generating data for this survey. The revitalization process kick-off since December 2017 in Addis Ababa where first renewal of pledge for silencing guns was witnessed by the signing of Cessation of Hostilities Agreement on 21st December 2011.CEPO observation report focuses concretely on cross examining the aims and methodology for revitalizing the Agreement on the Resolution of Conflict in South Sudan. The observation then offered or proposed recommendations and way forward. The observation specifically intends to assess how much was the idea of revitalizing ARCSS practical and viable in bringing peace to South Sudan since already the idea of renegotiating the peace agreement is not part of the definition of revitalizing ARCSS. Further, this idea of non-renegotiation of ARCSS was seriously disputed by all the opposition groups. Bearing in mind that the context of conflict resolved by ARCSS in 2015 has changed due to many aspects following the6thJuly 2017 “JI” violence. Among the essential changes of the context prior revitalization of ARCSS are, the players who are signatories to ARCSS have developed concrete mistrust and lack of confidence towards each other, principle signatory such as SPLM/A-IO separated into two factions under General Taban Deng (known as SPLM/A-IO in Government) and SPLM/A-IO under Dr. RiekMachar, new armed and non-armed opposition groups merged to challenge the incumbent government of national unity and some immediate neighbors of South Sudan who are also state member of IGAD have taken side with one or some of the conflicting parties. The change of political attitudes and language by the principals of the conflicting parties towards each other for paving new pathway for political transformation of the situation from violence to peace. The principals of the conflicting parties turning their language to positive can contribute greatly for the citizens to have trust and confidence for owning the revitalized ARCSS. For instance the president making public statement that “The peace agreement he signed with the opposition marks the end of civil war in the country forever” was remarkable but opposite of this statement is destructive. So, the principals of signing political parties have to change their language and political attitude through trust and confidence building under the auspices of church leaders. Upon formation of revitalized TGoNU, there is need for the principals of the conflicting parties especially at presidency to have reconciliation breakfast. It should be followed by joint tour of the presidency officials to the states. The presidency officials have huge task of demonstrating commitment for peace and stability of the country. Some of the immediate neighbors of South Sudan that have vested interest in South Sudan are required to compromise for peace and stop facilitating actions that undermined peace and stability in South Sudan . Every moment has its beginning and end. It is the best way to obtain peaceful end of a moment than facing hard challenges during end a moment. The revitalization on the Agreement on the resolution of Conflict in South Sudan kicked-off in December 2017 in Ethiopian capital, Addis Ababa with the aim of gaining renewal of pledge from the previous signatories to theAgreement includingthe newly established armed and non-armed opposition groups for peaceful settlement of the existing political crisis the country is facing since mid-December2013. All South Sudanese conflicting parties and other stakeholders were engaged on invigorating the ARCSS chapter 1 on governance and chapter 2 on permanent ceasefire and security arrangements. The IGAD Summit of the 32nd Extra-Ordinary Assembly of IGAD Heads of States and Government held on 21st June 2018 in Addis Ababa, Ethiopia requested President Omer Al Bashir of Sudan to facilitate a second round of face-to-face talks between President Salva Kiir Mayardit and Dr. Riek Machar, including other South Sudanese parties and representatives of Civil Society, Faith Based leaders, Youth, Women and Business Communities to resolve the outstanding issues. In July 2018, Sudanese mediators were able to reach agreement on the outstanding issues of permanent ceasefire and security arrangements. This is immediately followed with mediation on the outstanding issues of governance. The mediation on outstanding issues of governance took long and did not manage to win consensus on the resolutions of addressing the identified outstanding issues. Speaking to the members of the conflicting parties during the mediation processes in Ethiopia and Sudan. Tracking the public statements made by the principals and some influential members of the conflicting parties. Assessing the media reports on the fate of the peace mediation. The report is largely informed by key informants narratives that were made public through interviews. It was very clear from the definition of the objectives for revitalization ARCSS which does not mean renegotiating ARCSS. The objective definition is centered on the concept of just making some editing on ARCSS irrelevant /expired articles in chapter 1 and 2. Revitalization of ARCSS entailed elements of renegotiating some provisions of ARCSS in chapter 1 and 2 since the number of the conflicting parties has increased and the context of rebellion varies from one opposition group to another. Throughout the phases of ARCSS revitalization in Addis Ababa, there was no common understanding of what is meant by revitalization. The common understanding established was of the government perspectives which arein line with IGAD perspectives for revitalization that was centered on making some minor changes in the provision of ARCSS chapter 1 and 2 without introducing new provisions as a renegotiation of ARCSS. While the opposition groups strongly believe that by revitalizing ARCSS it means renegotiating it not just merely editing of ARCSSS articles in terms of the language and reallocating timeline for renewal of pledge to implement ARCSS. The absence of proper and common definition of revitalization of ARCSS to the conflicting parties and stakeholders contributed strongly in making disagreements or hardening making of compromises by the conflicting parties. Speaking to all the opposition group negotiators, for them revitalization of ARCSS without renegotiating chapter 1 and 2 is meaningless and waste of time. This belief has shaped the mindset of the opposition participation in ARCSS revitalization. Tracking IGAD direction of ARCSS revitalization process. The process has given chances for renegotiation of some provisions of ARCSS chapter 1 and 2. The government has not objected that but the government is keen for the idea of renegotiating small tent government. The opposition groups called for “Lean Government”. Government rejection to the idea of small tent government and standing for big tent government was because of the factors to keep General Taban Deng and his political group within the revitalized ARCSS government. The factor of Taban Deng with his political group has become the driving element of defining revitalization of ARCSS. Majority of the opposition groups stand on the ground that revitalization should be directed by IGAD for removal of General Taban Deng and his political group from the government while the government’s stand point is that revitalization means accommodation the new rebelling groups into government without removing General Taban Deng and his political group. The core problem with the concept of revitalizing ARCSS was absence of clear practical definition for revitalizing ARCSS. All negotiating parties and stakeholders and partners of the peace process have different and clashing understanding of revitalization of ARCSS. Revitalizing ARCSS chapter 1 was easily in Sudan-Khartoum phase because the mediators being security and military experts who understood the security context of South Sudan and the stand point of the armed opposition groups. The mediators were able to direct the process of the mediation to engaged renegotiating security arrangements and permanent ceasefires.Sudan-mediation attempted to direct the process for sorting out of the outstanding issues of governance in same manner like that of security outstanding issues, but Sudan mediation could not succeed because renegotiating governance outstanding issue is at centre of the root cause of the conflict. The SPLM/A-IO under Dr. Riek Machar was at some point atfixed position with regard to revitalizing outstanding issues of governance. This is because the first interest of SPLM/A-IO was the acceptance for return of Dr.Riek Machar to his political status of First vice president per the provisions of ARCSS 2015. For SPLM/A-IO any attempt to remove or not accepting Dr. Riek Machar as first vice president then revitalization of ARCSS chapter 1 is meaningless. The balance between revitalization of ARCSS means renegotiation or non-renegotiation has created bid of consensus between the government and SPLM/A-IO while it left the opposition groups particularly SSOA in harder position. The concept of revitalization adopted by IGAD directly has shaped the process of the peace as starting mediation without any return to questions such as what is the root cause of violent conflict. Does the violent conflict need to be resolved from an approach of conflict management or confliction transformation? The methodology of the revitalization is hybrid in perspectives that it wants accommodation of new opposition groups and maintenance of the existing system. The approach of “accommodation of new opposition groups” and “maintenance of existing system” was viewed by the opposition as tactics of prioritizing principle of power sharing more than responding to the actual problems behind the on-going violence. But this method gained acceptance from the government and reasonable acceptance from SPLM/A-IO. The methodology of HLRF has no effective role in adjusting the gaps that prevailed during procedures of the phases of HLRF. The option that was attempted to create some more confidence on the methodology of the HLRF was the attempts of initialing Inter-link Consultations (IIC) and face to face meeting. 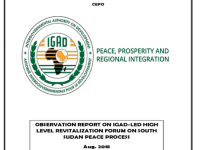 The other factor that injured the methodology of HLRF was the undermining of the methodology per IGAD mediation by some immediate neighbors of South Sudan in offering contrary proposal for sorting out the outstanding issues on governance. The appetite of the conflicting parties to compromise for peaceful settlement of their political difference was very low because their expectations were not met by the revitalization methodology. The dualism of the methodology for revitalizing ARCSS has contributed greatly in reducing the conflicting parties’ appetite for compromising including some IGAD partners’ appetite for standing strongly behind the outcomes of the ARCSS revitalization. With the little trust and confidence from some IGAD partners, there will be a high possibility of limited interest for funding revitalized ARCSS implementation. Several messages have come out from the likely or possible donors for funding the implementation of the revitalized ARCSS. The donor community needs proper and effective confidence that revitalized ARCSS will not collapse and there is strong political will to implement it as pathway of retuning the South Sudan back to process of democratic transformation. Already the incumbent vice president of South Sudan is calling peace actors to support financing the revitalized ARCSS implementation. The peace agreement implementation funding should be executed like previous, building clear benchmarks between the government of revitalized ARCSS and donors for funding the peace implementation is essential. One factor that can bring peaceful efforts of the on-going political crisis to zero if not handled carefully is lack of observation of the ceasefire and dragging of feet on executing the permanent ceasefire and security arrangements. Armed parties lack of respect and honoring the ceasefire normally demonstrates their lack of will for peaceful settlement of their political difference. The affirmative action agreed upon by the signatories to ensure women representation and participation in the peace implementation to be based on allocated quota of 35% for women was great, if executed by the tasked political parties. It is essential to utilize the 35% for women beyond the interest of securing numbers of women in the government. The past character where parties’ signatories to ARCSS turn to downplay execution of agreed upon affirmative action for women should be tackled this time well by the women rights activists. Indicators, for the possibility of the political parties turn down the accurate execution of the 35% for women in various public office is higher, because during the revitalization of ARCSS it was clear that some political parties lack female delegates for revitalization of ARCSS. It is required that this time round attention should be paid to 35% for women to be reflected in various political and civil servants representations and participation in the government. Limited lens of observation on political execution of the 35% for women only are misleading and reduction of women influence on public agenda as long as women are not effectively present among the various civil servant positions of the government. The trend of theviolence since 2013 was fully involved youth in either championing violence or attempting to create pressure of the conflicting parties for non-violent resolution of their politicalcrisis.It is necessary to involve the youth as agents of positive change for the future since they constitute half of the population in the country. Without engaging young people in the public affairs issues the chance of discontented politicians using them for their personal political interest gain is high. Evidence tasking young people political responsibility offers them chance to pick up dialogue and decide what type of future they want for themselves and future generations to come. The signatories to the revitalized ARCSS have to trust and have confidence on the role of media and freedom of expression for maintenance of public trust and confidence on revitalized ARCSS. Suppressing the freedom of expression or denial access to information for public consumption will be one of the factors that will contribute effectively in making the pubic lost trust and confidence on genuine implementation of revitalized ARCSS. Further, the public will distance them from owning the revitalized ARCSS. Ownership of anything is determined by freedom from fear in talking about it. If the public is not free to talk about or question the implementation of revitalized ARCSS freely forget about their trust and confidence even ownership of revitalized ARCSS. Media should be allowed to operate freely and responsibly within the context of the existing laws. The recent observed shrinking civic space for freedom of expression demonstrates fear for the implementation of the peace accord provisions specifically those provisions that have direct link to justice, accountability, transparency and reforms targeting policies/legislations and institutions. In 2015 Peace implementation process IGAD has taken back step from the position of being influencers to the signatories of the peace agreement. This step contributed in weakening the efforts for generating political will and good faith politics from each of the signatories of the agreement. The practice of IGAD distancing from the peace agreement implementation phases especially during pre-transitional period phase is bad practice and it aids actions that lead to the collapse of agreement. IGAD need to take responsibility of accomplishing the signatories of revitalized Agreement on the Resolution of Conflict in South Sudan effectively for delivering smooth peace agreement implementation. IGAD strengthening presence in South Sudan will be great incentive for influencing the signatories of the revitalized Agreement on the Resolution of Conflict in South Sudan. In 2015 the peace agreement collapsed because IGAD have limited presence in South Sudan that was unable to create any influence on the signatories of the peace agreement. Further, IGAD capacity was not at stage of offering technical support such as proper interpretation of the peace agreement provisions when the signatories clash and differ in interpreting any provisions of the agreement. African Union (AU) engagement in promoting smooth implementation of the peace is essential especially keeping AU Peace and Security Council pro-active on the process of attaining peace and stability in South Sudan. AU being involved in South Sudan through the African Union Liaison Office in South Sudan (AULOSS) and the AU “ad Hoc high-level committee or (AU C5)” with the membership of Rwanda, Chad, Nigeria, South Africa and Algeria as heads of states and government. This was followed by appointment of AU High Representative to South Sudan, who is intended to enhance Africa’s support to the mediation efforts of the Intergovernmental Authority on Development (IGAD).But the office of the AU High Representative to South Sudan is on silence since early March 2017 till today. The last active role observed as action of the AU High Representative to South Sudan was the visit to Yei and Malakal which ended up with remarkable statement. In 2015, AU was having very limited experts for helping the signatories for smooth implementation of the peace agreement and this has resulted in negative impact. AU C5 reluctance in engaging on the peace implementation in 2015 was clear demonstration of low significance of AU for stressing the peace agreement signatories for genuine and timely deliverance of peace. Beyond doubt, AU dragging of feet in accelerating the process of the hybrid court.The failure of AU C5 not meeting officially on their role and responsibilities on South Sudan peace process since their initiation is a practical example. The role played recently by Nigeria, Rwanda and South Africa as members of AU C5 is needed more with consistence. For instance, the statement issued by the AU C5 alongside the 7th meeting on the margins of the 31st Ordinary Session of the Assembly of Heads of State and Governments, in Nouakchott, under the chairmanship of President Cyril Ramaphosa of South Africa, it has not been followed up with action. Just it ended up as press statement as usual. Criteria for participation in TGoNU: The responsibility -sharing agreement will certainly limit the participation of communities that did not participate in violence and will bring the same individuals who contributed to causing violence conflict in South Sudan. Civil Society with support of IGAD may develop criteria (human rights violations, corruption, and political records in previous governments and participation in next election) for those who will participate in TGoNU and to ensure inclusive representation of all communities of South Sudan; particularly in the legislature. .
IGAD partners meeting should be held prior finalization of ARCSS revitalization for implementation. There is need for the government and the parties signatories to revitalized ARCSS to strongly demonstrate political will and acceptance for genuine implementation. The principals of the parties signatories to revitalized ARCSS need to first conduct genuine reconciliation in the front of the public and further visit the communities across the jointly with spirit of reconciliation under the auspices of South Sudan Council of Churches. Immediate discussions with donor community on possibility of funding implementation of revitalized ARCSS are paramount. The signatories should be ready to be faced by some conditionality for funding implementation of revitalized. There is need to facilitate session on harmonization of ARCC chapters is paramount after the signing of revitalized chapter 1 and 2. Civil society to develop clear criteria for candidates who will participate in TGoNU. IGAD, AU and UN to support the adherence of the signatories to these criteria. The IGAD-led mediation process has to embrace the principle of inclusivity and focus on the root cause of the conflict. Conflict management approach for resolving South Sudan political crisis is only suspension of the violence. Therefore, applying the approach of conflict transformation is the best because the political crisis in South Sudan is not about responsibility sharing only. Matters of systematic root causes of misunderstanding that generated clash of opinion are rooted in South Sudan political crisis. The principals of the signatory parties to the agreement should undertake some duties and responsibilities that generate political will and acceptance for peace implementation. The benchmarks adopted will be automatic use as indicators for measuring progress and predicating possible failure. Nouakchott, 30 June 2018: The African Union High Level Ad Hoc Committee for South Sudan, convened its 7th meeting on the margins of the 31st Ordinary Session of the Assembly of Heads of State and Governments, in Nouakchott, under the chairmanship of President Cyril Ramaphosa of South Africa. The meeting was attended by President Paul Kagame of Rwanda; Prime Minister Ahmed Ouyahia of Algeria; Minister of Foreign Affairs of Nigeria Geoffrey Onyeama and the Chief of Staff of President of Chad, Ms. BanataTchale Sow. The meeting was also attended by the Chairperson of the AU Commission, MoussaFakiMahamat, Ethiopia State Minister of Foreign Affairs HirutZemene, as representative of the IGAD Chairperson, as well as by the AU High Representative for South Sudan, former President Alpha Omar Konare and the Commissioner for Peace and Security, Ambassador SmailChergui. The Ad-hoc Committee exchanged views on how to more effectively enhance its support to and cooperation with IGAD in the ongoing efforts to resolve the conflict in South Sudan. It commended the IGAD for its tireless efforts in mediating for a political solution to the conflict in South Sudan. The Committee holds the view that there is need for unity of purpose among all the actors in order to create the required momentum for successfully concluding the peace process in South Sudan. The Ad-hoc Committee welcomed the recent progress in the peace process, as evidenced by the face-to-face meeting between President SalvaKiirMayardit and Dr. ReikMachar on 27 June 2018, in Khartoum, Sudan, which culminated in the signing of the Khartoum Declaration Agreement committing the South Sudanese parties to a permanent ceasefire. The Ad-hoc Committee emphasized the added value of the Ad hoc Committee to the IGAD-led peace process and underscored the need for Africa to fully assume its responsibilities and create all requisite conditions for definitively ending the war in South Sudan and salvage the civilians who have suffered the brunt of war for so long. The Ad-hoc Committee called for the elaboration of a roadmap to guide actions, including imposition of punitive measures against those who violate the ceasefire and obstruct the peace efforts. The Ad-hoc Committee noted with deep concern the continuing worrisome political, economic and humanitarian situation in South Sudan and its negative effect on the ordinary citizens. They called for urgent actions to address the economic and humanitarian plight in the country. The Ad-hoc Committee reaffirmed its commitment to continue supporting the IGAD-led mediation process, through the High Level Revitalization Forum, as well as to the implementation of all its outcomes. Addis Ababa, 14 March 2017:The African Union High Representative for South Sudan [AUHRSS], former President Alpha OumarKonare of Mali, undertook a six-day working visit to South Sudan from 1 to 7 March 2017. The objective of the visit was to follow up on the progress of the peace process, and new opportunities that could inform and promote more refined and constructive decision-making on overall peace in the country. The visit, which was also undertaken within the framework of the joint AU, IGAD, UN Statement of 29 January 2017 on South Sudan, was to seek viewpoints on the National Dialogue Initiative announced by H.E. President SalvaKiirMayardit, the challenges and the potential responses to the Dialogue, and in what ways the Dialogue could serve as a complementary tool for peace in the country. During the visit the High Representative met with H.E. President SalvaKiirMayardit, First Vice President Taban Deng Gai, and the Minister for Foreign Affairs and International Cooperation, H.E. Deng AlorKuol. The High Representative also interacted with the secretariat of the National Dialogue Initiative. Further on, he met with the Special Representative of the UN Secretary General, and Head of the UN Mission in South Sudan, Mr. David Shearer, the African Diplomatic Corps, the European Union Delegation to South Sudan, Troika Countries and other bilateral partners. The High Representative also visited Malakal, the capital of Central Upper Nile State, as well as Yei, the capital Yei River State, and met the Governors and leaderships of the State parliaments, chiefs and community leaders, faith-based groups, women and youth representatives. He interacted with UN and other international and national aid agencies, and representatives of Internally Displaced Persons [IDPs] in both towns. In all his interactions, the High Representative shared the view that violence remained an unacceptable and unstainable approach to ending the nation’s crisis, and that the AU, UN, IGAD, and the partners and friends of the country will continue to urge for political and other non-hostile means to peace. He stressed his commitment to remain firmly associated with South Sudan, and to continue to explore with the leadership of the country, both internally and in the diaspora, for an inclusive, holistic, broad-based, and sustainable peace in the country. With the view to alleviating the disastrous effects of the famine, the AU High Representative discussed with the Authorities about the possibility of identifying some islands of peace and prosperity, especially in those well-endowed parts of South Sudan, and to support them with the objective of producing enough food for the local population as well as to support the overall food security of the rest of South Sudan. The entities to be supported should present themselves as models in terms of peaceful dialogue in the resolution of the local conflicts.